Okay, we admit it: our reports may be a bit dry. They are informative, accessible, clear, organized, and those are good things, but we’re not designers and we have hard numbers to get across. So we’re always pleased when the client brings in a design professional to help communicate our findings. This recent graphic for the Florida horsemen is our new favorite. Civic Economics and Cummings Associates of Boston studied the economic impact trends for horse racing in Florida, and were surprised ourselves at how positive the findings are. Did you know that Florida horse racing is bigger than Spring Training baseball? Or that Florida is actually growing as a hub for the racing industry nationwide? Neither did we. And now horsemen around the nation will, too, from this creative, concise summary of the findings. Thanks to Remi Belloq of Kentucky’s Bluegrass Community and Technical College for this outstanding cartoon for an upcoming horsemen’s publication. 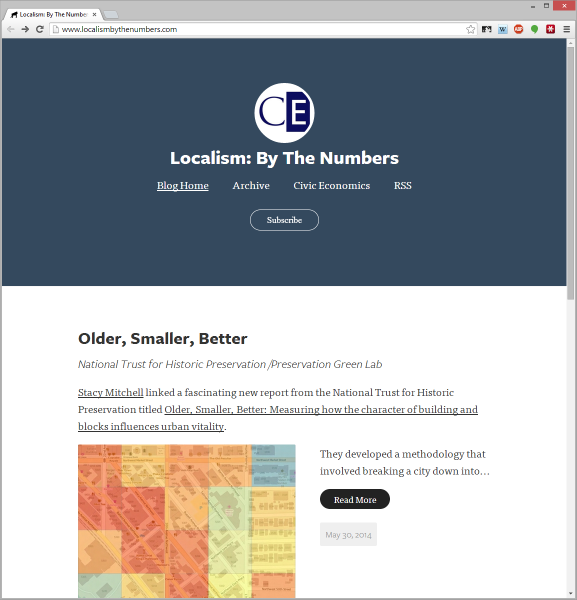 Civic Economics is pleased to introduce Localism: By the Numbers, a blog in which we’ll explore the localism movement through numbers and statistics. We’ll feature some of our own work, and discuss that of others. We hope it’ll be both enjoyable and thought-provoking. 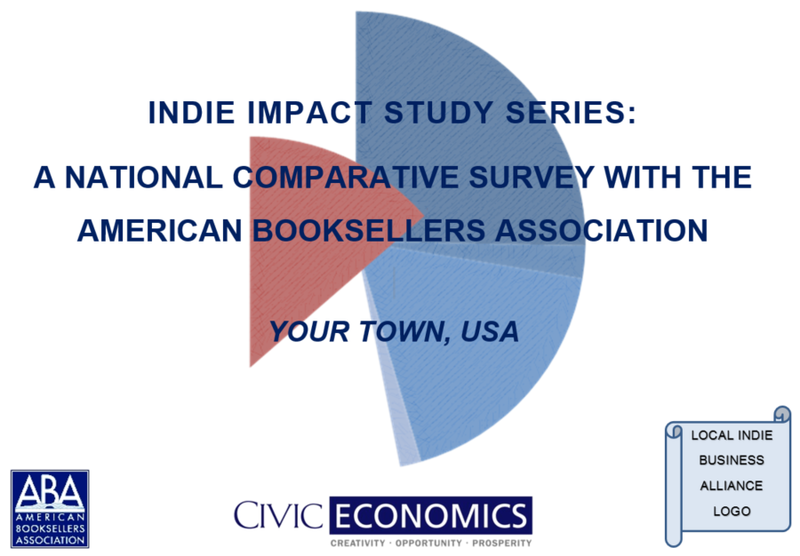 Ever since we began quantifying the economic benefits of independent local business, Civic Economics has heard from dozens of communities interested in studying the impact of their own indies. We want to make that easier to accomplish. A few communities have mustered the resources, financially and otherwise, to commission a complete local study. Talk to the folks in Vancouver, New Orleans, Phoenix, San Francisco, Grand Rapids and others and you’ll hear lots of good reasons to make the serious commitment to a study addressed to the particular issues facing a community. But we understand most independent business organizations simply can’t make that happen. That’s why, since 2012, we have partnered with our friends and yours at the American Booksellers Association to offer a streamlined approach to the question. For modest fees and a willingness to recruit participation, your town can now provide your constituents with a local study quantifying just how vital your independent retailers and restaurateurs are in the local economy. The communities that have participated so far have enjoyed valuable earned media and consumer education benefits, and the impact keeps growing. Moreover, your participation contributes just a bit more to our understanding of independent businesses nationwide. If your organization, business, or government agency is interested in learning more, please visit us at: http://www.civiceconomics.com/indie-impact.html. If you want to join the likes of Salt Lake, Raleigh, Chicago, and more, get in touch with Matt Cunningham to talk about the possibilities. Since 2002, some of you may have noticed, we’ve been a bit loose with the official communications from Civic Economics. The website got stale, we rarely updated the Facebook, and we were completely absent elsewhere. Most of our business comes by word of mouth, so these things may have slipped a bit. But we made a New Year’s resolution to do better, and it only took five months to get this moving. 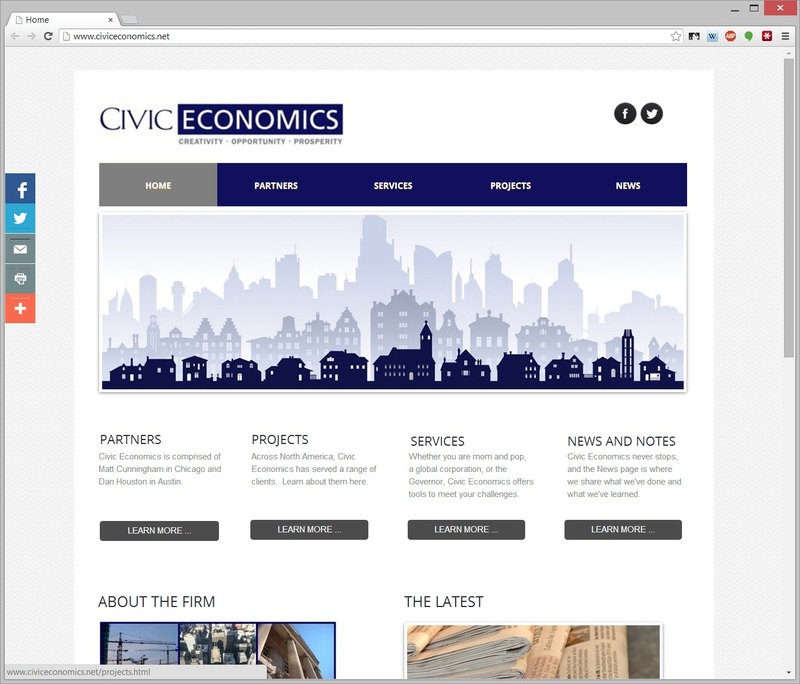 The new CivicEconomics.com is rolling out to a server near you soon. Our visitors have long appreciated the wealth of substantive content on the old site, so we’re expanding the materials available to download and making it all easier to find. Be sure to let us know what you think. Matt says this “Twitter” thing might be for real, so he will be keeping up on the new Twitter.com/CivicEconomics and we hope you will, too. When we read something good, or visit someplace fascinating, we will make a point of letting you know. We will use CivicEconomics.wordpress.com to share news about the firm and our work, though you don’t need to bookmark that one: the feed will automagically appear at CivicEconomics.com. And, of course, we’ll keep up with old friends by reposting all that new stuff at Facebook.com/CivicEconomics. All our thanks to the friends of the firm, and we’ll look forward to keeping up with you for another twelve years.